Undergraduate Applicants & Graduate Applicants who applied before September 15, 2016, see below. Graduate Applicants who applied on or after September 15, 2016 should check PSYCAS to check their application status. To log in to the Applicant Portal, please visit my.paloaltou.edu, and log in with the username and password that you received by e-mail after submitting your application. If you did not receive a username and password, or if you need the e-mail re-sent, please contact your admissions counselor to have the log-in information re-sent. 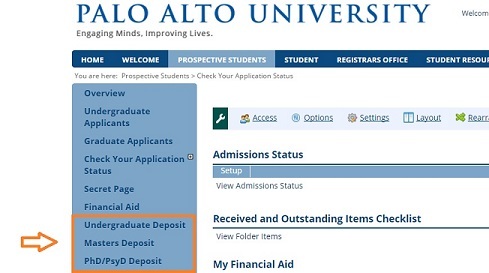 In the applicant portal, applicants can see a list of required application materials, with materials that have been received and those that are still outstanding noted on the list. After you have submitted your application, please check the applicant portal regularly to monitor the progress of your application. 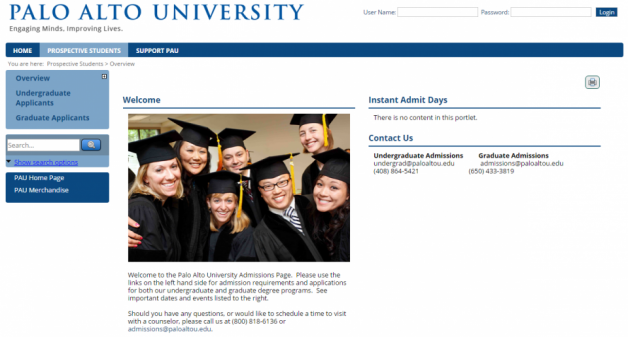 Please note, application materials are processed as quickly as possible in the order they are received, and materials are checked off in the portal as soon as they have been received and processed by the admissions office. If you have been admitted to a program at PAU, you may confirm your enrollment in that program by submitting your tuition deposit, as instructed in your acceptance letter. To submit your tuition deposit, click the “Confirmation” link that will appear in the applicant portal after being admitted to a program.